The strategy was to place political pressure on lectureship directors to use women as keynote speakers at university programs. At the end of this panel discussion, I realized a united effort is underway to change the churches of Christ through insurgent influences. The public persona of those seeking to instill erroneous change is one that invites public discussion, but seeks to cast off the shackles of biblical teachings to embrace a hermeneutic of subjective feel-good authorization.1 Instead of following the plain teachings of the Word of God, these advocates teach that feeling a particular giftedness means full authorization for those actions God forbids within the Word. Years ago, some individuals within the fellowship likely wanted to expand the role of women into the realm of unauthorized territory and for various reasons remained silent. But the time for silence has ended for those who promote female leadership. Purposeful attacks and planned keynote addresses aim to turn the tide in favor of women preachers. Last year at the Pepperdine Lectureship, a young man presented his case for the inclusion of women in all roles within the church.2 He used the text of Galatians 3:28 as his proof to argue that Paul was advocating no gender distinctions in Christianity. This line of thought totally misses the original intent of Paul’s words in this section. Paul, however, addressed the exclusive nature of circumcision in direct contrast to the inclusive nature of baptism. Through baptism women were also freed from the exclusively male act of circumcision and Gentiles were freed from the need to be children of Abraham. All Christians are sons and daughters of God through their faith in Christ Jesus. The underlying plan for including these female preachers is to increase the comfort level of members of the church in having a woman preach. These are attempts to gain a foothold in the minds of the listeners. Perhaps, if people can become accustomed to a woman preaching at a lectern, this will increase the likelihood of church members accepting a female preacher on Sunday morning.5 Do not be fooled, this is an intentional plan of those seeking to change the church. There are even events that showcase young preachers including, in some cases, young women preachers.9 An event in particular called “Next Gen Preacher Search” was an event that encouraged various young people to submit sermons in order to be judged on their quality. The top 40 choices were invited to Pepperdine University to compete in this American Idol-style preachers’ event. Naturally, it was noted that women also trying out to be “contestants” on “Next Gen Preacher” could function in various roles within the church. But it is noteworthy that no mention was made that some of these women desiring to be preachers are speaking to mixed groups. Do not be fooled. These young female candidates are being encouraged to use their gifts of public proclamation in gatherings where men and women will both be present. The idea of giftedness is prevalent in the feminist agenda. The focus on women being allowed to preach has shifted from seeking biblical authority to the idea of purely giftedness in public speaking. The argument is that if God has “gifted” a woman with the ability to speak in public, God must want women to speak before men and women. In the words of one young female intern, “If I feel that the Lord is speaking to me directly and telling me to do something … then I can do it.” There is a belief projected that if one can preach, one has the biblical right to preach. The woman in the video goes on to state, concerning others’ feelings about her preaching: “men and women of older generations come to me and say ‘You are brave.’ Or come to me and say, ‘My mom had the same gifts you have. She didn’t get to use them. I’m glad you get to.’”10 She felt her calling to preach was validated. The Pepperdine keynote speaker said that every role of church leadership should be available to women. Why? Because they have been gifted. This idea of giftedness authorizing preaching or leading highlights the current culture of our time. Instead of going to the Bible for the answers on this debate, those who advocate this change are appealing to the entitlement mindset within America today. In some ways, people do not want to be given limits. Rather than allowing God to define the boundaries for humanity, humans are defining the boundaries through subjective feelings. But no one has the right to trample on God’s boundaries in His intended pattern. If giftedness is the only authorization needed, Jesus would have been able to serve as a Levitical priest, but He was not allowed because He was from the tribe of Judah (Hebrews 7:14; 4:14-16). I am sure no one would claim that Jesus was not gifted enough to fulfill this role, but He did not because it was not in line with God’s plan for Him to do so. The feelings of those promoting women into leadership are fickle. The church leaders appealing for unbiblical expansion for women’s roles are being hypocrites. Within the list of the churches of Christ that are gender inclusive (if you survey the listings for the various preaching ministers of each congregation), you will note that almost all of them are men. Also, if you noticed the “Next Gen Preacher Search,” a few ladies participated, but none of them made it to the final four contestants. Those who say they believe in women preaching are still holding women back from this role. 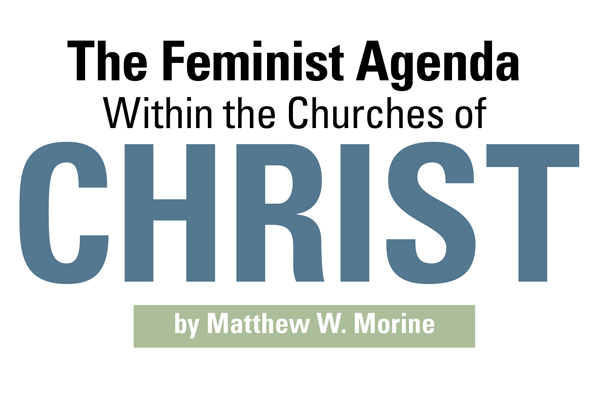 In these churches that claim gender equality, you do not see women in the role of elder. You should wonder why. It seems these same individuals argue for this right for women, but seldom practice it within their local church. I would suspect that these people do not feel that they have enough support within the local fellowship to make these radical changes. This should be a red flag that these changes are about nothing more than political maneuvering. And nothing proves an agenda like playing politics within a local church. Beware and do not be fooled; hidden forces are at work seeking to corrupt your congregation and lead it into an unfaithful direction. Matthew W. Morine is the author of A Mountain Moving Faith and preaches for the Castle Rock Church of Christ in Castle Rock, Colo. He can be reached at mmorine@hotmail.com. 1. To see the organized effort in actions go to www.1voice4change.com. 2. Here is the video of the Pepperdine address: https://www.youtube.com/watch?v=TzkAkFaIDTM. 8. The video of the intern preaching has been taken down or made private from YouTube. 10. This video was removed from YouTube.